Having stayed in Egypt slightly longer than we’d planned, it was time to get our skates on and get La Mischief ready to roll in only two days. My first job was to fix the toilet, now that I’d managed to get my Jabsco servicing kit through Turkish customs for an exorbitant fee. Next time, I’ll use normal post, rather than UPS as Turkish customs don’t tend to worry about packages in the post (I did this with my Watermaker winteriser pack I had sent from France). This first job was an abject failure as the chopper I’d left soaking in a bucket disappeared to the bottom of the marina. Bummer. We quickly arranged for a new one to be purchased by Barbara from West Marine in California – to be delivered personally when Joe and Barbara arrived in a week. Luckily we had a couple of spare working heads on board. Next job was more of a success. The three new batten cars that I bought in Perth were fitted successfully, although the third batten car keeps pulling out under the stress of the square rig. Dee had taken our broken Raymarine Autopilot head back to the USA and had scored big time, getting a free replacement even though the unit was out of warranty. 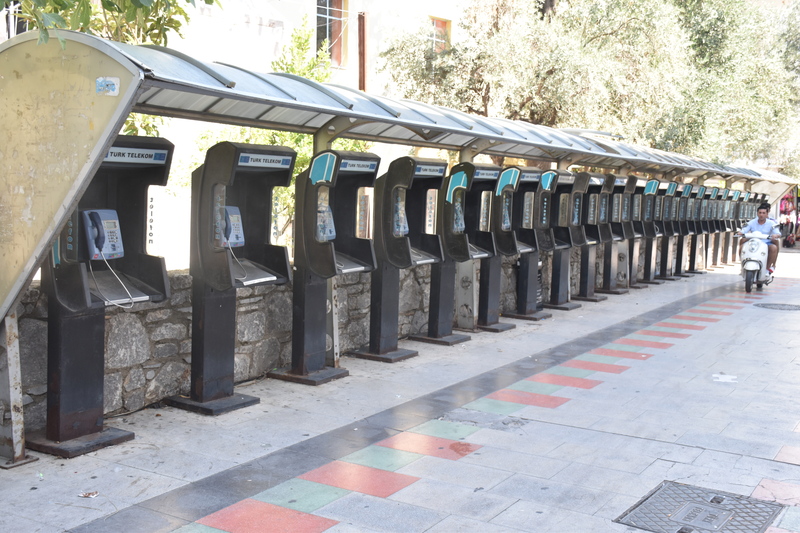 This was after the guys in Gocek tried to sell us a new unit. Thanks Raymarine. The rest of the jobs were largely putting back stuff we’d stored inside for the winter and getting the boat somewhat clean. The marina at Karpaz was cheap but any services we would have liked done were not. We looked at lifting La Mischief and getting her bottom painted and top and sided waxed and polished, but the costs were pretty steep so we gave that idea away. I’d previously looked at getting the engines serviced but I’d quickly worked out this was a bad idea so my cunning plan was to sail back to Gocek and get Sanli to organise it. Jobs somehow always get done in time and off we went. Ozge, a friend of ours from the Marina, came along to help us out, and the 3 of us got going about 10am after we managed to complete our formalities and leave our berth. We’d tossed up a few destinations and in the end we settled for Kas, 230nm away. When you leave the Turkish Republic of Cyprus, you need to go to Turkey as Turkey is the only country in the world to recognize the Turkish Republic of Cyprus. After Turkey, you can go wherever you like. We arrived in Kas at 8am having motored for 2 days on a glassy sea. 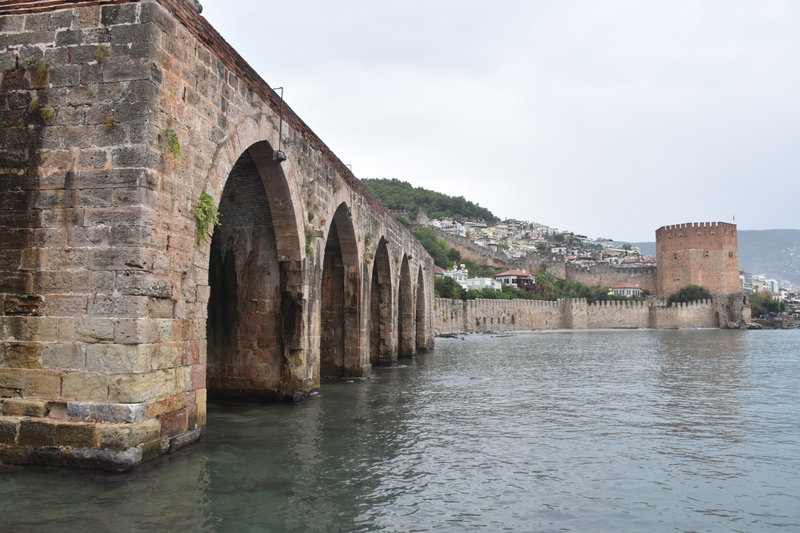 We called in to the old harbour (rather than the new marina) and were met by an agent, who for 200 turkish lira, checked us in. Then it was off to catch up with our friends from Kas. It didn’t take us long to catch up with Smiley, still as useful as ever. He organised a diver to help with our awful looking bottom, it was a complete ecosystem down there. We got our gas bottled swapped and did a few other chores before catching up with Mutlu at his beach bar. Then it was off for a great meal at Smiley’s, which felt wonderfully familiar. Next morning it was up at the crack of dawn, Ozge feeling the effects of the Raki from the night before was moving noticeably slower. The wind was still non-existent so we stopped and anchored off the beach at Olu Deniz and had a look at the lagoon. 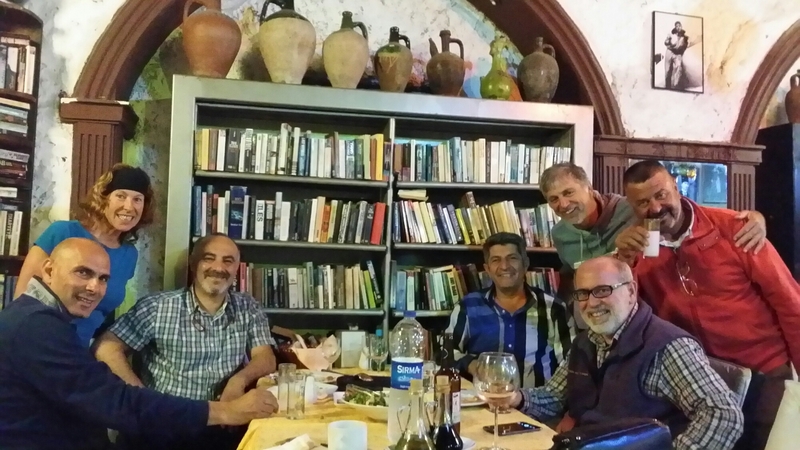 Then it was onto Gocek for our date with Sanli and his team. All four engines received a service, our decks were waxed and polished, our stereo was replaced by a Fusion unit I picked up in Perth along with replacement speakers for the back (they were falling apart after a couple of years) and new waterproof Fusion speakers for the front installed under the eyebrow. As Sanli was getting this all organized, I was putting together the toilet – lucky me – I always get the good jobs. Dee meanwhile had picked up Barbara and Joe and was showing them all the sights around Gocek – Saklikent Gorge, Dalyman River Tombs and Pinara. Meanwhile Ozge said his goodbyes and caught a plane back to Ercan via Istanbul. 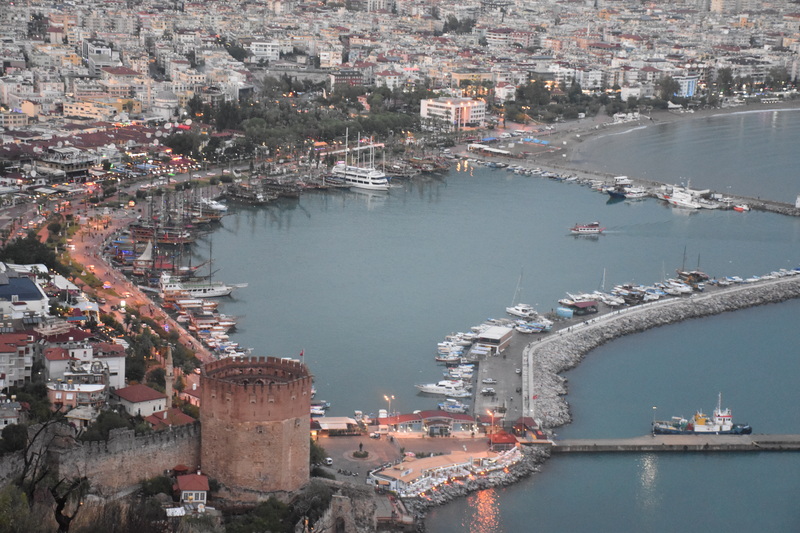 Then it was off sailing once more, first to Fethiye to check out of Turkey and then to Rhodes to check into Greece. We left Fethiye in zero knots of wind and ended up in Rhodes in 40 knots of wind, right on the nose of cause. Welcome to windy Greece. We checked into the largely empty Rhodes Marina for 57 euros a night, too late to check into Greece so we had a quiet night on the boat. Next morning it was a 2km walk into town to visit the Port Police, Customs and Immigration, before checking out the old town with its wonderful castle and windy walking streets. Still one of my favourite destinations. Then it was off to one of our other favourite destinations – Lindos. We had a great sail down the coast, scooting along on a nice reach. Joe and Barbara were loving it. We got to Lindos in the late afternoon to find a couple of yachts there – different to the crowded anchorage we found last time. We got a prime spot right off the beach on the sandy bottom. No wrapping our anchor chain around any rocks this time. Anchored up, we dingied ashore and walked up to the castle, which had already shut for the day. Then we headed back down into the town and stopped off at our favourite Captains Bar. Saves (Greek for Steve) was there to great us and we reminisced about a few late nights in his bar last season. Then we headed off to check out the amphitheater and across to Ay Apostoli, an enclosed bay on the other side of Lindos where I had my first Greek Mojito of the season – oh how I’ve missed them. Dinner at Stephanies (but not on the roof – too cold) completed a pretty good day. Next day, it was up to the castle on the top of the headland, breathtakingly beautiful. The girls were keen to go shopping so I retreated to a nice beachside café for some blogging and photo uploading, which takes time in Greece given the piddley amount of bandwidth. Back on the boat, it was time for our first swim of the season in the beautifully clear water of Lindos. An afternoon relaxing before we pulled anchor and headed south towards Kasos, on the way to Crete. With 4 of us on board, the night went quickly as the winds died and we motored all the way. We arrived in Kasos at about 9am and had to administer mouth to mouth to see if we could possibly solicit any life out of the place. We pronounced it dead as a door nail and decided to make our own life. We bought fresh fish from a local fisherman and had it cooked at Mylos Restaurant overlooking the bay. Two other cats had pulled in and we met up at the restaurant to breath some life back into the town. One cat was Canadian, the other English and they had both been wintering in Crete at Agios Nikolaos, and had good things to say about it. With another night sail coming up, we had to curb the wine and beer, in time to sober up for our 6pm departure. The sail to Crete was pretty uneventful, with flat seas and what wind there was, was on the nose most of the way. We managed to get to our destination ahead of sunrise, so we floated around until 6.30am and then went into Spinalonga. Really disappointed to miss this annual event. 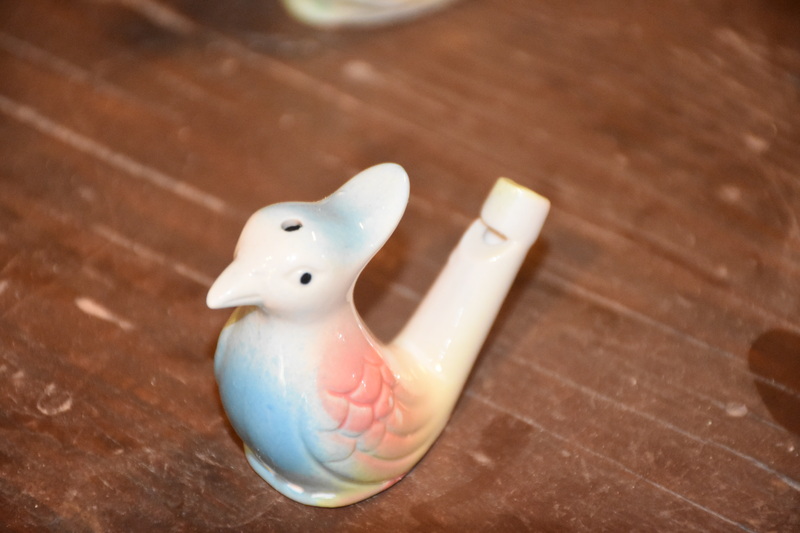 Its held in January each year in Selcuk in Turkey. See Annual Camel Wrestling and Video. Just when I thought I was done for the year, Kim pipes up and suggests I publish my top 10 for the year. So here goes…. 2. 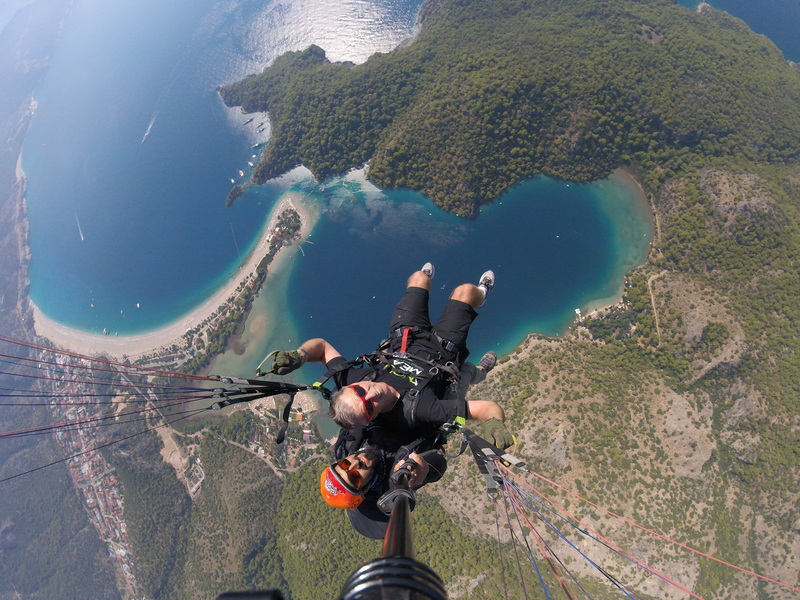 Paragliding over Oludeniz – most fun we’ve had in a long time. 9. Konya – The stunning Mevlana Museum – especially when lit up at night, the Whirling Dervishes, and the Lamb , the beautifully slow cooked tandoor kebab, so nice we had to visit again and pig out on 500g of Tandoor Lamb each. Plus just about everywhere else we went – so many highlights – this is really an impossible task. I’m sure Dee and everyone who joined us will have a different list. Hindsight’s a wonderful thing. 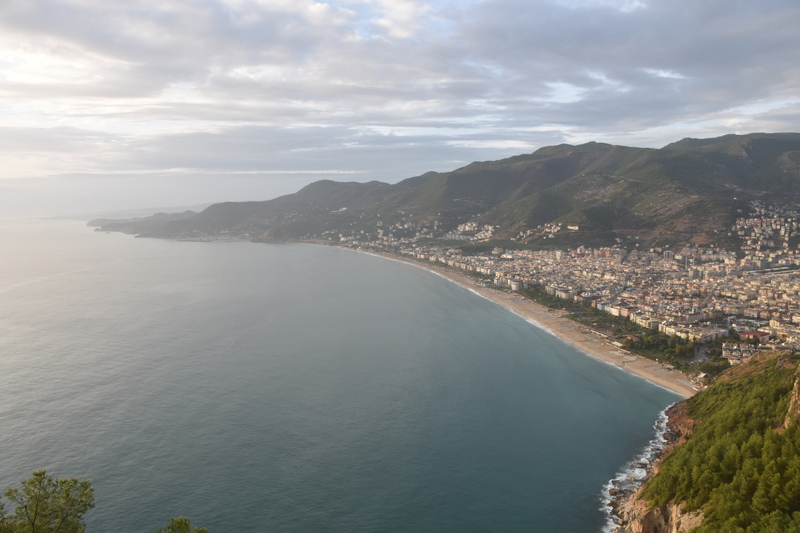 It would have been great if we had been able to make Alanya that day so we could bunker down in a nice marina, whilst the very bad storm that was forecast passed by. However, we didn’t quite make it. We left Kemer in overcast conditions and pointed our nose across the bay to where Alanya lay 60nm away. The first part of the day was okay as we had a 20kt wind coming in at a 30-40 degree angle off our nose. We were making good mileage at 7kts with one engine on, lamenting the fact that we had to bypass Antalya, where we would have been able to get into the old port (conditions willing), but agreeing that we needed to get to our final Turkish destination before the weather set in. But what’s the saying about the best laid plans? About one-third away across the wind had picked up to 40kts and was straight on our nose. We were lucky to make 4kts as the swell began to rise. We were suddenly looking at a 1am arrival in Alanya, which meant 12 more hours of bashing into a crap sea. We veered 40 degrees off the wind and headed towards land thinking the fetch would be less, and we may be able to creep along the coast, which should keep the fetch and the swell down. Interestingly, our course took us straight towards Side, 30nm from Alanya. Now we’d been to Side on our road trip and spied the small harbour there. We’d read a blog of a yacht that had been caught there in bad weather and it was not that encouraging. However there appeared to be a good anchorage outside the harbour that had protection from the Easterlies that were building. We got there about 3pm in the afternoon and poked our nose inside the small harbour to have a look. There was one other yacht in there, together with 5 or so gulets. We started to anchor next to the other yacht when Mustafa appeared and told us to both anchor and pick up a mooring in another spot, which we did. Mustafa turned out to be a fantastic guy and a godsend as he got us settled for the storm that was coming the next day. It was about this time that the second yacht up’ed anchor and moved along the coast to the river at Manavgat, something we should have considered as well. Rod suggests that Side is not the greatest place in a southerly blow. That night it rained cats and dogs and quite a few other animals. The wind got up a bit as the thunderstorm hit – it swung round to you guessed it – the south. Wasn’t very pleasant but the mooring and the anchor held. Next day Mustafa came and helped us attach a second mooring and we also attached long lines to the shore from our front and middle cleats to help take the strain off our back cleats. We also moved away from the quay and used the dingy to pull us between the boat and the wall. We were all set for another few days of bad weather, inside the harbor. Luckily for us the wind blew fairly consistently from the East for the rest of our stay in Side, getting up to 48kts at times as the swell bent round into the harbour and caused La Mischief to surge back and forwards on its port mooring lines. The narrow harbor entrance was unprotected by a breakwater and with the swell rolling in there was no way we were going anywhere else even if we wanted to. Mustafa came round for drinks a couple of times and once brought fresh fish (besides being the harbor master, he also had a fishing boat and a tour boat). He came for lunch and cleaned, gutted and cooked his fish on the BBQ. Yum. He loved that his name was the same as Attaturk’s and had named his son Atta in his honor. A few days into the storm, Hugh joined us. We’d met Hugh in Fethiye at the Rugby and he’d agreed to join us for the trip across to Cyprus. Hugh finished Uni a few years ago and is now a tour guide with Topdeck, having also spent time in South America. Not sure, what Hugh thought when he rolled up to find La Mischief riding out a pretty bad storm, but Hugh turned out to be calm and considered and took it all in his stride. With some time to kill, the three of us went off exploring Side. It turned out to be a great place to be stranded for a few days as its great ruins are some of the most notable in Asia Minor. They cover a large promontory where a wall and a moat separate it from the mainland. There are colossal ruins of a theatre complex, the largest in this part of the woods, built much like a Roman amphitheatre that relies on arches to support the sheer verticals. The Roman style was adopted because Side lacked a convenient hillside that could be hollowed out in the usual Greek fashion. The theatre is big, seating 15,000 – 20,000 people. The temple of Apollo, right on the waterfront, with its wonderful Greek columns was being blasted by the sea spray. There’s also a good museum and some other Greek ruins that impressed us. The town too was good to wander through, with numerous walking streets on the small peninsula. There were some great beaches to the West with a nice promenade along them that we looked at but didn’t swim in. It was here that Hugh found his Putin on a Bear and Angela Merkel in a revealing top T-Shirts. Both absolute classics. The second last morning we were there, a nasty thunderstorm came through and broke our port mooring. Luckily that was the last hoo-rar, and the wind quickly settled down after that. Not so for the swell as this took an extra day to abate. Next day, we paid 200TL for a diver to repair the broken mooring, whilst Hugh took a dip to untangle the dingy painter from the prop, as it had somehow managed to get caught up in the last storm. The swell had settled enough for us to depart through the narrow entrance so then it was off to Alanya. For photos of Side, click here. La Mischief came with four 120AH Gel Batteries that were failing fast. It was disappointing to see that they lasted less than 3 years, but the first winter in Yacht Marine caused some issues. And 480AH in total was a bit undersized as La Mischief is somewhat hungry on the electricity front, often chewing through 25A of juice at times. I had increased the solar panels to 1000W to try and compensate but I was fighting a losing battle. After much research, I decided it was time for some Lithium batteries, LiFePO4 to be exact. 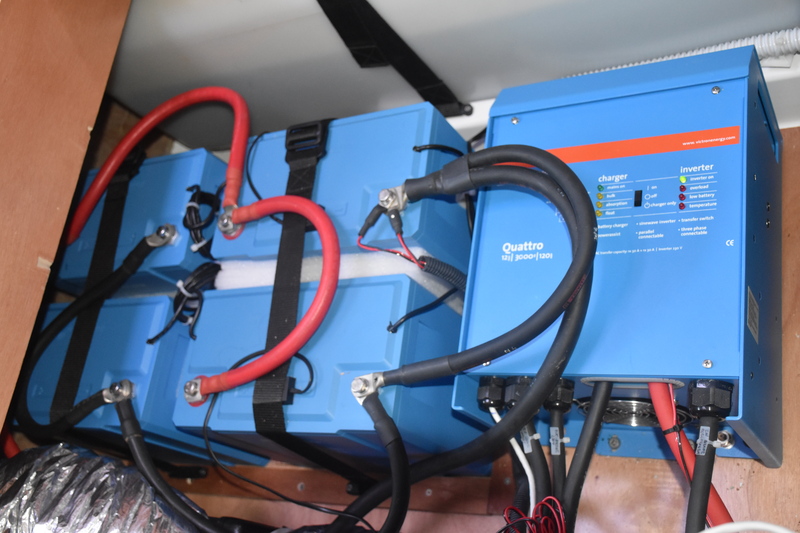 I settled on four 90AH Victron LiFePO4 batteries, which we calculated to be just enough as Lithiums can be run down to 20% quite comfortably. Having now installed them, I’m still not entirely convinced this is enough as I’m finding I still have to run the genset in the morning for 30 minutes. its is however going into winter so the solars don’t get as much of a run as they used to. Time will tell. Fitting Lithium batteries is not just a simple matter of swapping out the old Gels with the new Lithiums. Sanli and his helpers spent three days completing the job, 15 hours in total. Luckily, we managed to find a spot at the publicly owned Town Marina, rather than having to pull into Skopea Marina, which is the least expensive of the very expensive private marinas in town. They weren’t keen on Cats at the Town Marina, but Dee managed to sweet talk them into letting us have a berth. 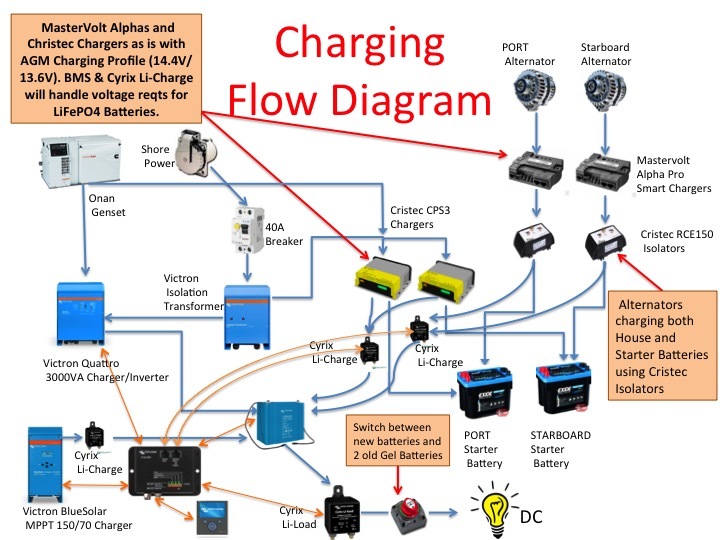 The somewhat complex charging architecture. 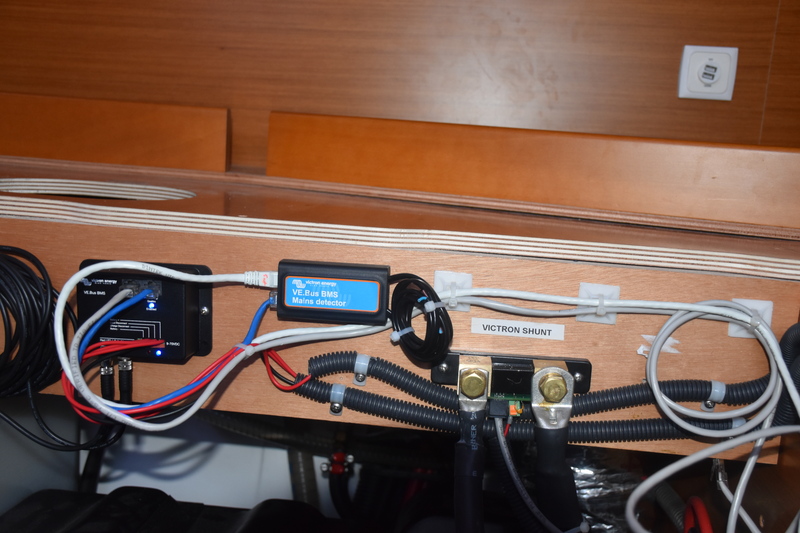 The Lithiums need their own Battery Management System (BMS), that controls the batteries as well as the Victron chargers and some relays to stop over charging and over loading. This BMS is a single point of failure so at some stage, I will need to pick up a spare. The Victron Quattro Inverter/Charger needed a firmware upgrade to work with the BMS as the BMS now controls it’s charging behaviour, as well as shutting the Invertor down if the batteries get low. The Victron Bluesolar 70/150 Charger also needed a firmware upgrade but to do this we needed a very expensive VE.Direct to USB interface cable (part number ASS030530000 for my future reference) that Sanli didn’t have. I will need to pick up in Oz. 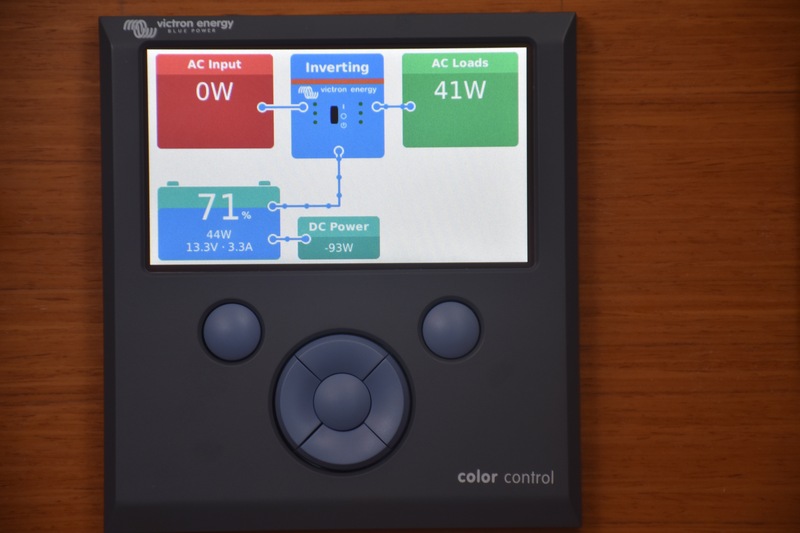 With the right firmware in place, the BMS controls the Bluesolar charger, but for the Victron rep in Turkey recommended that we stick a BMS controlled relay in to control the charging. Battery monitoring is also an issue. I now have a Victron BMV700 battery monitor and associated shunt, together with a new Victron Colour Control GX Monitor. This Colour Control gets its information from the Battery Monitor and the Quattro. With the firmware update on the Blue Solar unit, I will be able to get the solar panel input on this unit as well. However, I’m still not comfortable with my monitoring setup. The State of Charge can be showing 100% and I still have 150A going into the batteries. In the old days, I could use the Voltage of the batteries as a fairly good indication of their SOC but not with the Lithiums. They keep their charge high right up to when they start to go flat. I’ve been through the BMV700 manual and played around with the Peukert exponent and the Charging Efficiency factor as per the manual but still no luck getting the SOC to make sense. The other outstanding item I need to get going is the wireless interface to Victron’s VRM Portal. From here, I can get email alerts and monitor the whole setup from my phone using Victron’s android app. I bought a Wifi dongle in Fethiye, but the CCGX didn’t recognize it so I need to get the Victron dongle. I will wait to I get back to Perth to pick this up. 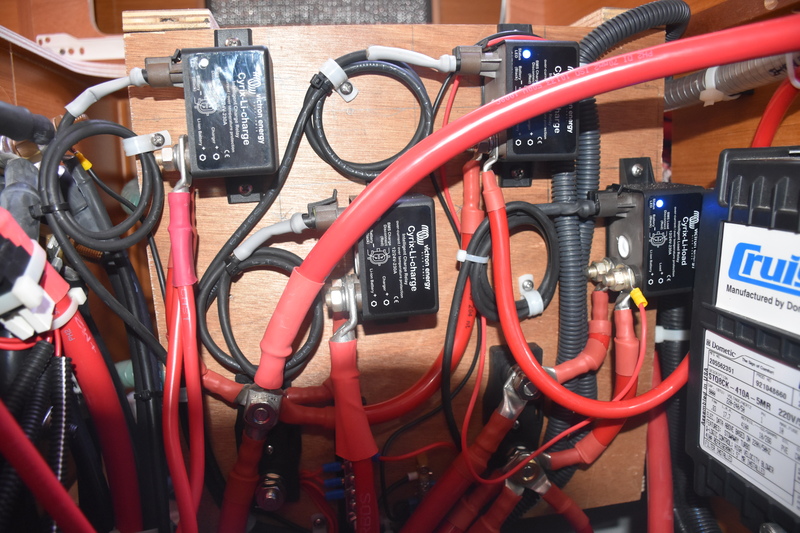 The good news was I didn’t need to change the existing (non-Victron) charging components from Christec and Mastervolt. All I needed to do was to place some BMS controlled relays between them and the new batteries, and the BMS took care of regulating the voltages. Because of the complexities of the new system, I took Allan’s wise words of advice and left a couple of my old batteries in place, together with a battery switch so that in the event of a failure, I can simply switch across to the old batteries until I can sort out what the problem is, rather than having alarms going off everywhere in the middle of a night passage with no power. A very sensible idea. Allan’s been a great help as he has installed Lithiums on Camelot and I’ve been lucky to pick his considerable brain power in this area as he’s very much in love with his battery set-up. After a few weeks cruising I’m starting to get my head around the new system. One thing I’m not sure about is the Load Disconnect function of the BMS. My understanding is that the BMS will automatically disconnect the Victron Cyrix Li-Load Relay when a cell’s voltage drops below 2.8V. At one stage, I saw the voltage of the batteries drop to 11.9V, which worries me as I would have thought the Li-Load relay would have permanently tripped by then. The BMS should also shut down the inverter at the same time, but this was still running. Further investigation is required. In the meantime, I’ve set a low voltage alarm at 12.5V on the BMV700 battery monitor, so I can start the genie if I need to. Victron and Allan – expect a phonecall. Our cunning plan to get back from our road trip and get the batteries installed hit a few snags. Firstly we hadn’t banked on Kurban Bayrami – the “Feast of Sacrifice”. Our batteries had arrived in Turkey but were going nowhere until they got through Customs. This proved to be an issue as public servants got an extra two days holiday on top of the four that the rest of the population got to celebrate this great festival of Islam. So off we went cruising whilst we waited. This plan turned out to be also problematic as all the bays were filled with Turkish holiday makers on their boats. Never the less we managed to find some space to anchor as we checked out the wonderful cruising grounds the Gulet cruises call “Twelve Islands”. 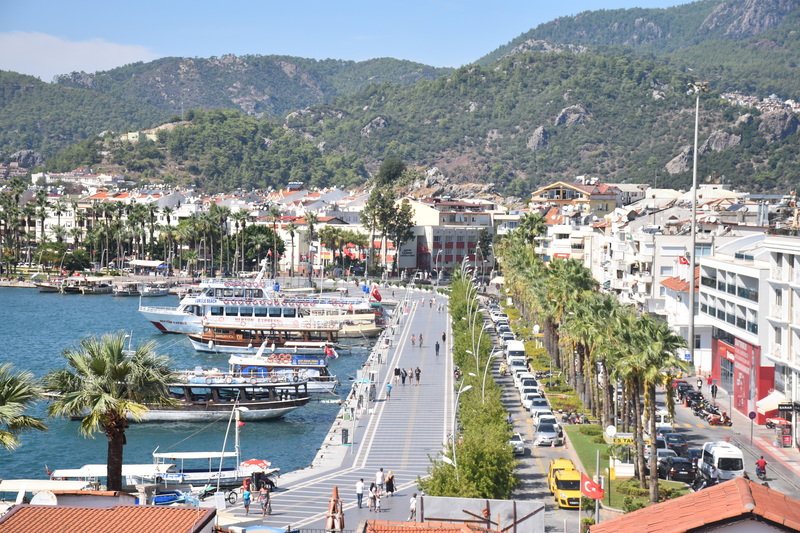 We then made our way up to Marmaris and spent a few days there checking out all the beautiful bays we hadn’t anchored in last time as well as the town. Then we made our way out of the bay and around the corner to Turunc, where we were delighted to see Paul and Tess on Paradise. We first met in Atlantic Spain and caught up with each other a few times before we went our separate ways in the Balearics two years ago. It was nice to catch up and enjoy some meals and drinks together again. On the way back to Gocek, we stopped in Ekincik Bay and went around to the entrance of Dalyan River to check out the nice beach there. We had thought about spending the night there but it was quite exposed and when it started to get a bit rolly so we thought better of it and headed back to Ekincik. We then headed back to Gocek to find that the batteries had arrived but Victron hadn’t provided Sanli with the necessary drawings they had promised. Everyone was getting hung up on the Mastervolt Alpha Pro chargers I had on the alternators. So Sanli, bless his heart, hopped on a plane to the Istanbul Boat Show to get things sorted. I also took the opportunity to pick Allan’s brain and took his advice to add a selector switch to a couple of the old batteries as an emergency fall back. Whilst all this was being sorted out we headed into town to watch the AFL Grand Final with Ross, Ros, John and Leonie from Gone With the Wind 2, a Lagoon 620 with a Fremantle registration. It’s impossible to find the AFL on TV in a Turkish bar so we reverted to my subscription of WatchAFL.com on my laptop over breakfast. At least the breakfast was good as we watched the Hawthorn machine ruthlessly win yet another AFL premiership. At least the rugby was on at a sportsbar, which also happened to double up as a bowling alley of all things. It was run by a nice Scottish lady who was right into her rugby, so we managed to watch a few great games of world cup with the guys from Gone With The Wind. 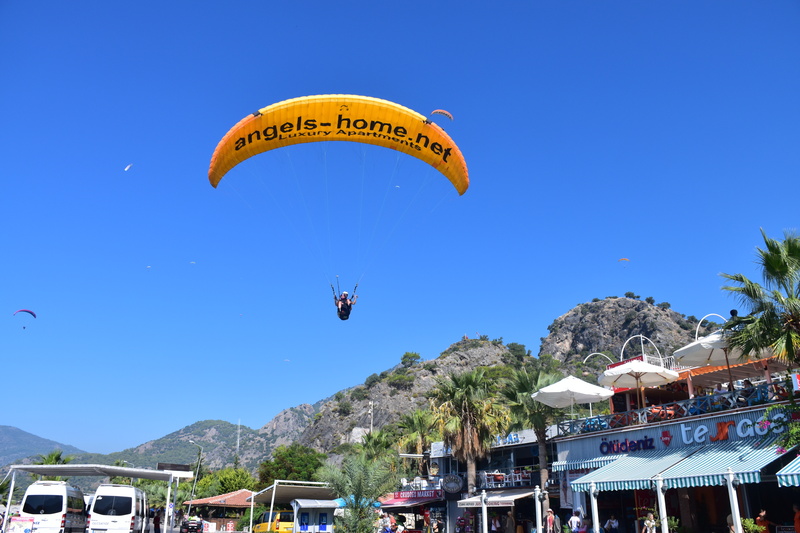 To fill in more time, we organised a paragliding adventure at Oludeniz. It turned out to be so much fun. Paragliding from the top of Mt Bagadag down to the coast at Oludeniz is said to be the best coastal paragliding spot in the world – who am I to disagree. The drive up the mountain on a narrow road was quite scary. In fact, it turned out to be much more scary than jumping off the top of the mountain attached to my pilot. The view from way up there was spectacular, looking straight down on the Blue Lagoon and out to St Nicolas Island. I got a turn at flying as we cruised around with about 20-30 other paragliders. We landed next to the beach on a walk-way amongst all the tourists walking in front of the Oludeniz shops and restaurants. After the excitement of the paragliding, we hopped back in our Hire Car and drove over to Kalakoy, which gained a certain amount of fame from a great book called “Birds Without Wings”. 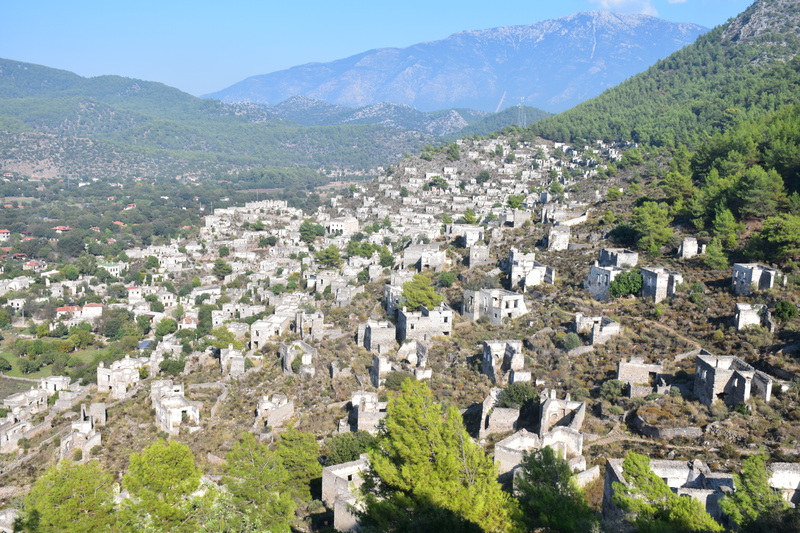 Kalakoy is a deserted town, dating back to 1923 when all the Christians were sent across to Greece, in exchange for all the Muslims in Greece, just after the Turks had won their war against the invading Greek Army. It was great to wander this deserted town, after just having read the book. Playing over, it was time to head back to Gocek for our new batteries.